SkyVentures takes you para-gliding near Jodhpur, and promises a good dose of adrenaline release with an amazing squad of stunt pilots. Adventure enthusiasts, take note. The folks at this Jodhpur venture are a very happy bunch, and they make sure you have a great (and safe) time while you’re with them. You can hop on a glider with a professional pilot without any need for formal training. And yes, there’s no bar on clicking selfies (you’ll always have physical proof of your badassery). 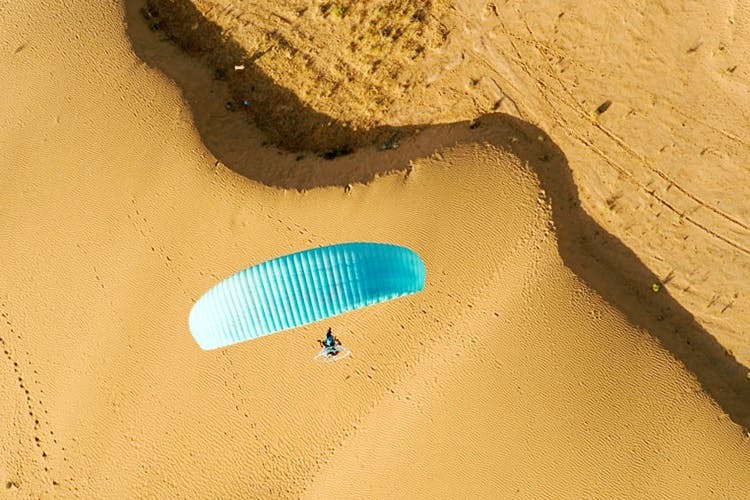 If you’re super-serious about learning how to paraglide (and are willing to spend about 5 days for it), these guys provide training courses for para-gliding, hang-gliding and paramotoring training. Their prices start from INR 2,990 per person for para-gliding, which is the only thing an amateur can do here at the moment, as you need to have professional experience for hang-gliding. For more info on the pricing, you can always directly get in touch with them. Going up there with a stomach completely full or not appropriately dressed (as in, too tight or something you’d feel cold in) might make you uneasy. Similarly, those who aren’t too good with intense heights, it’s better to discuss with their team what are the precautions you need to take before gearing up.